Heavily dependent on energy revenues, Alaska is suffering economically due to the recent plunge in oil prices, a blow made all the more poignant by the fact that the cost of energy here is exceedingly high. 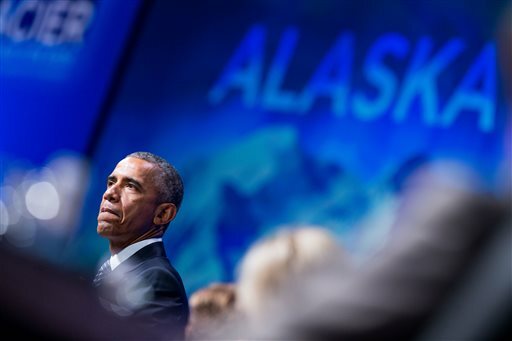 Alaska leaders of all political stripes have implored Obama to open up more of the state to drilling to help alleviate a $3.5 billion budget deficit that has triggered steep cuts to state services — a critical lifeline for poor and rural Alaskans. “For a population as small as we are, it’s pretty significant,” Alaska Gov. Bill Walker told reporters aboard Air Force One as he flew with Obama to Anchorage. The president has struggled to explain how his dire warnings square with steps he’s taken to expand energy production, even at the risk of higher emissions. Environmental groups took particular offense at the administration’s move to allow expanded drilling by Royal Dutch Shell off Alaska’s northwest coast — just a few weeks before Obama came to Alaska to preach on climate change. “The timing of President Obama’s trip to Alaska and the Arctic could not be more ironic, given that his administration just approved dangerous drilling plans that put the region’s well-being in serious jeopardy,” said Michael Brune, the Sierra Club’s executive director. Some 700 square miles in the Kenai Mountains are blanketed by glacier ice, remnants of the Ice Age, when roughly a third of the Earth was covered with sheets of ice. One of nearly 40 glaciers springing out from Harding Icefield, Exit Glacier has been receding for decades at an alarming rate of 43 feet a year, according to the National Park Service. After hiking the glacier, Obama planned to put his survival skills to the test while taping an episode of the NBC reality TV show “Running Wild with Bear Grylls.” Then the president was to board a U.S. Coast Guard vessel to tour the national park before returning late Tuesday to Anchorage. Obama is as usual a hypocrite on this issue. He talks this crap and then saddles up to the Fossil Energy Barons buffet for another plate of lobster and a glass of Dom P. This is classic Obama , say all the right things about a topic and then sell out immediately to the Corps. causing the problem. He’s not to be believed on anything anymore. He might be a hypocrit, but moreso, he’s just a liar, just like all the warmers. Follow the money. this is no different than religion….if you don’t give me money, you’ll burn in hell. if you don’t give me your money, climate change will kill you. the nuts who believe this are really out there and gullible. It’s not like religion. Religion is a matter of belief that cannot be experimentally proved. Global warming / climate change is science and the “greenhouse effect” that it rests on is easily demonstrated in any high school science lab. Money has NOTHING to do with it. Why , you believe that is because you spend too much time listening to FAKE news , stupid radio and the rest of the right wing echo chamber.